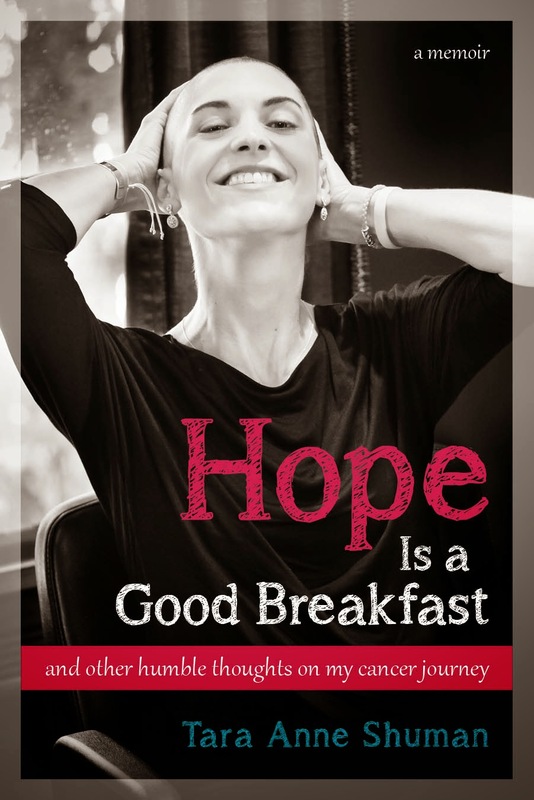 Hope Is a Good Breakfast - The Blog: "I do Crossf..."
Preface: Despite that I believe in the importance of healthy living, conversations about diet or exercise regimens can easily get under my skin. I realize that by writing this post, I risk being annoying in ways that I hate to be annoyed, but I really don’t mean it that way. I’m not pitching anything to anyone. Rather, I mean this piece as an explanation of my own behaviors and, on a totally different note, as a great big Thank You. I’ve written before about how I have not always had a healthy relationship with exercise. In fact, in my freshman and sophomore years of college, me and exercise had a very abusive, love-hate (mostly hate) relationship. I abused exercise and it abused me right back. It wasn’t pretty, and in fact, I have discovered several parallels between my experience coping with what was likely an undiagnosed exercise disorder and my experience coping with cancer. But that’s a story for another day. I’m proud to say that at this point in my life, I have the healthiest relationship with exercise that I have ever had. Since I mostly have one thing to thank for it, I thought that thing deserved a blog post. I saw this a while back and it made me laugh. In some circles, it's probably true. For me though, aside from this post and several unavoidable references in prior posts, I don’t talk about CrossFit very often. 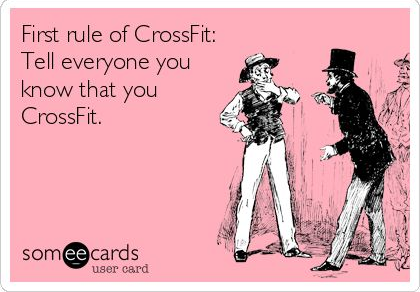 I don't even really like using the word "CrossFit" because I feel like people who don't do it immediately start to judge. 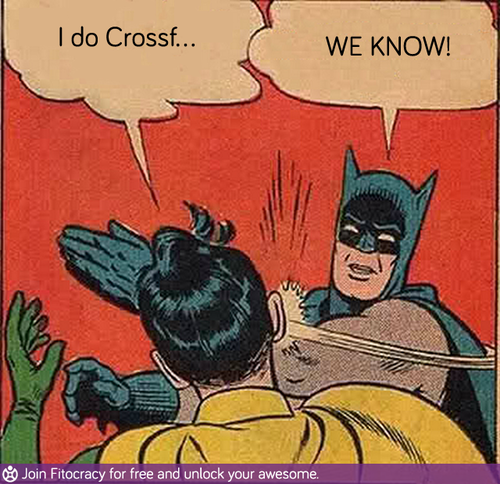 For instance, my siblings constantly give me a hard time about my love for CrossFit. They joke that it’s a cult and that we have secret handshakes. They are wrong, but I go along with it. Plus, when my sister tried CrossFit, she loved it, and I know that my brother would love it, too, so I'll get the last laugh in the end. From what I have seen from the inside, there’s nothing cultish about CrossFit. The people who are really good at it are wonderfully supportive of the newbies and of the regulars who will never be as good as them. There are countless people like me who go to a class a few times a week, who can’t lift the prescribed amount of weight in any workout, and who still believe that CrossFit is a significant part of their physical and mental health. “You do CrossFit?” he inquired rhetorically. Dr. Bunnell said he would most certainly take the pain seriously and he continued to ask me what I do at CrossFit that hurts it. I shrunk in embarrassment. “Handstand pushups tend to hurt it,” I explained quietly, knowing how ridiculous that sounded. He laughed, respectfully. Then he told my mom and I about an article he read recently that discussed the rates of injury to people who do CrossFit. I told him that yes, people can easily hurt thmselves, but that I am really careful. I was being completely honest. I know what physical pain can do to my mind so every time I’m at the gym (sorry, I will never be able to call it a “box”) I am constantly focused on not hurting myself. In the end, Dr. Bunnell ordered the bone scan despite that he thought that the pain was musculoskeletal and/or due to nerve damage from my breast surgeries (or better yet, my no-breast surgeries). I didn’t say anything else about CrossFit in that appointment although in retrospect, I want to explain what that place means to me. So here’s a short list. I spent far too much time in my life thinking about being skinny and far too little time in my life focused on being strong. I love that CrossFit encourages strength rather than a particular body image. Getting stronger, faster, more fit, those are the goals, even if they add weight to the scale or make your jeans hard to get over your legs (both of which it has done for me). Gradually, however, something happened. A crew of early birds formed, or perhaps I just started to become part of a group that had already been there at 5:30 in the morning. It was (and is) a group of hard working, kind, and humble people who get up before the sun rises so they can pull, push, squat, jump, and endure what is, no doubt, an awesome sort of pain. Over several months, those people became important to me. They encouraged me when I was the last one on the rower (I think rowing may rely on body parts that I'm not certain I still have) and they cheered for me when I finished a grueling workout. Even better, when I did the same for them, I felt good. I know very little about the lives of the other early birds at my gym. But I know that they will support me and I will support them as we try to squeak out one more round of an exercise that makes us want to puke. And I know that we all get into our cars at 6:30 feeling physically exhausted and yet, comfortably proud. In those first painful years of college, I couldn’t workout enough to feel any sort of satisfaction. I would run or swim or cross-country ski for hours and still feel empty inside. I did it all to burn calories, and I calculated everything in my head in a way that I know now was pretty sick. I did it for all the wrong reasons, and I cringe at how much valuable time I wasted. CrossFit is particularly good for me because it has taught me that exercise is more about quality than about quantity. Today, for instance, the main part of the workout was just about eleven minutes long (for me, at least…for faster people it was shorter). Nineteen-year-old me would have scoffed at that. Just eleven minutes? What’s the point? It only took one workout for me to learn that I was a fool to doubt the intensity that could be packed into not-so-many minutes. And perhaps more than anything when it came to exercise, I needed to be proven a fool in that way. I know that I make way too many analogies between my cancer experience and other parts of my life, but here’s another one. Anyone who has been diagnosed with cancer, particularly, an aggressive and ruthless kind, has considered the reality that they may not live to be 90. Maybe we only live to be 40. Maybe we only have eleven minutes to everyone else’s 200. Well, then, I better put all I’ve got into those eleven minutes. That’s a huge reason why I love CrossFit. Despite that I’m 34 years old, I still have dreams (literally, not figuratively) about playing high school and college sports. I still miss it. I miss practices and games; I miss winning and even, yes, losing. Most of all, I miss being on a team and competing in a way that challenges me physically and mentally. In many ways, CrossFit helped fill that void for me. For one example, I learned a few months ago about this thing called “The Open.” It’s basically a way for real CrossFit-ers to qualify for regional or national CrossFit competitions (I think). But it’s also "open" to regular people like me. When Kevin started to encourage everyone at his gym to sign up, I ignored him. I thought to myself, That’s not for me. I’m just here to workout and release my mental stress. I don’t need to compete with anyone. I think subconsciously I also figured that anyone with a C-section pouch and stretch marks that will never go away wasn't really made for CrossFit competitions. But Kevin and the other coaches persisted. Finally, out of a feeling that I owed it to Kevin, I reluctantly signed up. For five weeks, CrossFit-ers across the country, and even, I think, across the world, did the same exact workout. No modifying weight or movements -- we were all stuck with the same torture, I mean, challenge. A few of the weeks, I couldn’t do more than 10 repetitions of the prescribed exercise and two weeks I totally forgot to even enter my pathetic score into the website. But a few of the other weeks, I shocked myself at what I was able to do. And in all of the five weeks, those workouts, perhaps more than any others, pushed me physically and mentally beyond what I thought I was capable of. Finally I figured it out. “Oh, the competition! Yes! Actually, I finished it!” And despite that even in the world of has-been high school athletes, I’m pretty weak, I still loved how proud I was of myself when I said that. I could go on and on with this list. I could talk about how I love that there's a different workout every day so I never get bored, how I appreciate that the coaches push us to constantly improve, how I sleep better, play golf better, and just generally feel better. I could write about how Kevin has used his gym to do so much good for several different causes. All of those things are true. But in the end, my love of CrossFit may be rooted in this fundamental truth -- that at a time when I felt like my body had completely betrayed me, CrossFit, and particularly, the people there, helped me learn to believe in it like I have never believed in it before.